I’m privileged to speak at entrepreneur conferences, lifestyle business and direct sales events, and to young entrepreneurs in student organizations such as DECA, FBLA, BPA, and more. The #1 question I’m asked when speaking, both onstage and off, is how to start a business. Even more, people want to hear the details behind how I started a successful and profitable lifestyle business. The word that best describes how I started Live It Forward LLC is “bootstrapping.” What follows is a brief definition of bootstrapping, along with three key bootstrapping strategies for how to start your own business. Bootstrapping is defined by Entrepreneur.com as financing your company’s startup and growth with the assistance of or input from others. It also refers to stretching resources—both financial and otherwise—as far as you can. The major benefit to bootstrapping your business is it is one of most effective and inexpensive ways to ensure a business’ positive cash flow. Bootstrapping means less money has to be borrowed and interest costs are reduced. For me, bootstrapping was the only option I considered when starting Live It Forward LLC. Kathy and I had been married 14 years and had been debt-free except for our house the entire time even though I was a youth pastor, which is not a very lucrative line of work, and she had been a stay-at-home mom before our children started school. In other words, we knew how to stretch a dollar and didn’t want to go into debt to start a side business. I was willing to hustle like crazy and invest every ounce of sweat equity I had because I strongly believe in the big is little and little is big principle. There are many things to keep in mind when bootstrapping your business, but here are three key strategies that were enormously important for me. First, I decided to view the bootstrapping journey ahead of me as an INVESTMENT with no downsides. You see, at the beginning I asked a lot of “what if” questions. What if I can’t gain any traction? What if I make a major mistake? What if all my side hustle doesn’t produce results, and it takes 10 years to get this business off the ground? As you can see, “what if” thinking can paralyze you! To overcome “what if” thinking, you have to change your mindset, and that’s exactly what I did! Instead of viewing the entrepreneurial journey as a problem to be solved, I started seeing it as an opportunity to invest in. I figured as long as I didn’t “bet the farm” and do something like take out a second mortgage to start my side business, there was no downside. I would meet people I’d never meet if I didn’t take this lifestyle entrepreneurial journey. I’d likely learn things I’d never learn otherwise. Plus, new opportunities were bound to open up to me that would have never opened up before. Did you catch the message? There are no downsides to the lifestyle entrepreneurial journey ahead of you, so don’t get paralyzed by “what if” thinking! Even if you don’t get your lifestyle business off the ground, the benefits of just traveling the path are enormous and will likely open up opportunities that are unimaginable to you at this moment. This proved true for me. Within the first three years of bootstrapping Live It Forward LLC, I learned more about starting a lifestyle business than I could have learned in a decade of just reading books or listening to podcasts. I was also blessed to become great friends and business affiliates with Dan Miller, New York Times best-selling author of 48 Days to the Work You Love. Additionally, one of the books I published was highlighted at the Mega Book Marketing Conference, which allowed me to share the stage and be interviewed by Mark Victor Hansen, co-author of the Chicken Soup for the Soul book series. Finally, one of the largest church-ministry publishing and training companies in the world, with whom I trained and wrote for during my bootstrapping years, asked if I was interested in a new position overseeing their youth ministry department. I wasn’t interested because of my commitment to Live It Forward LLC, but the fact they asked is a testimony of how new opportunities open up when you pursue your lifestyle business dream. Again, there are no downsides to pursuing the bootstrapping adventure ahead of you, so don’t get stuck asking yourself “what if” questions. This journey is not a problem to solve, it’s an opportunity to invest in! With that said, if you want to succeed as a lifestyle entrepreneur, you must also embrace the second word in the INVESTMENT-and-BUSINESS Mindset and treat your bootstrapping journey like a BUSINESS. This means a lot of things, but at the core it means you have stop dreaming about what could be and start hustling big-time! Even more, you have to create structure in your routine that allows you to hustle and take action. For me, even though I was the National Youth Director of approximately 2,000 churches and was traveling 100 nights a year when I started bootstrapping, and even though Kathy and I had three children in elementary school, I carved out a minimum of 15-20 hours a week to work on my lifestyle business. It definitely wasn’t easy, but it was doable. What I discovered is I had to scale back from all the fluff in my life so I could scale up my business. No more mindless TV. No more time-consuming hobbies that didn’t add significant value to my life. I even scaled back from volunteering, at least for this season of my life. My life basically revolved around four things: (1) spending time with Kathy and our children, (2) working my full-time job, (4) working on launching my lifestyle business, and (4) investing in personal development through journaling, goal setting, reading, and exercising (especially running). That’s all I did for three years, yet during these years I became a better husband, a better father, and a better person because I forced myself to scale life down to only those things that mattered most. Practically, here’s the power behind scaling down your life so you can scale up to at least 15 hours a week for bootstrapping your business. If you work 15 hours a week on your side business and do this for 48 weeks (take one week off each quarter), that’s 720 hours a year. 720 hours equals eighteen 40-hour workweeks in one year. This means during a three-year period you will work the equivalent of an entire year of 40-hour workweeks. If you really hustle and work smart, that’s plenty of time to get your side business off the ground! NOTE: It took me three years of working 15-20 hours each week to launch Live It Forward LLC to the point where I could quit my full-time job. A powerful strategy behind bootstrapping your side business is you don’t have to pay yourself a salary if you have another job. That’s why I encourage all my lifestyle business coaching clients to resist paying themselves for as long as possible in order to invest their profits in the 50-50 Money Management strategy described below. NOTE: Email me if you’d like to know more about Live It Forward’s Lifestyle Business Coaching. Personally, I invested the first 50 percent of Live It Forward’s profits into a cash fund. This one action helped me build a strong enough cash reserve that I was able to leave my full-time job before completely replacing the salary from that full-time job. When I did quit my full-time job, I calculated that if Live It Forward LLC only produced the same amount of revenue it had during my last year of bootstrapping, I could provide for my family for two years on the salary I could pay myself along with the cash-reserve cushion I had built. This gave Kathy and me tremendous peace when I quit my full-time job because we knew once I could give full-time attention to my lifestyle business, Live It Forward LLC would likely grow substantially and that’s exactly what happened! So what did I do with the other 50 percent of the profits from my business? I invested it back into the company. I purchased equipment, built a website, and marketed my services and products. But even more, I invested in the most important asset of any lifestyle business. I invested in myself! I attended conferences, hired coaches, and more. I saved both time and money by learning from people who were already doing what I wanted to do! NOTE: The first year in business Live It Forward’s total revenue was only $4,000. The second year—$24,000. The third year—$68,000. Again, during these first three years of bootstrapping, I never took a salary. This means by the time I committed to Live It Forward full-time, I had a cash reserve of $48,000. Additionally, I had invested $48,000 back into the business; with most of that money being invested into learning everything I could about building and growing a lifestyle business, how to be a career and lifestyle-business coach, and how to be a motivational speaker who actually gets paid to speak. In my first year of working Live It Forward full-time, revenues almost doubled to $128,000. I’ve written about stick-to-it-tiveness elsewhere. Just know, your greatest competitive advantage in starting and growing a lifestyle business is stick-to-it-tiveness. By no means am I the smartest or most talented person in any room, but I do stick with it! What I’ve discovered about stick-to-it-liveness is if you are persistent and learn all you can from each step you take, you will outlast 90 percent of your competition. This automatically puts you in the top 10 percent. I don’t know about you, but I love those numbers! 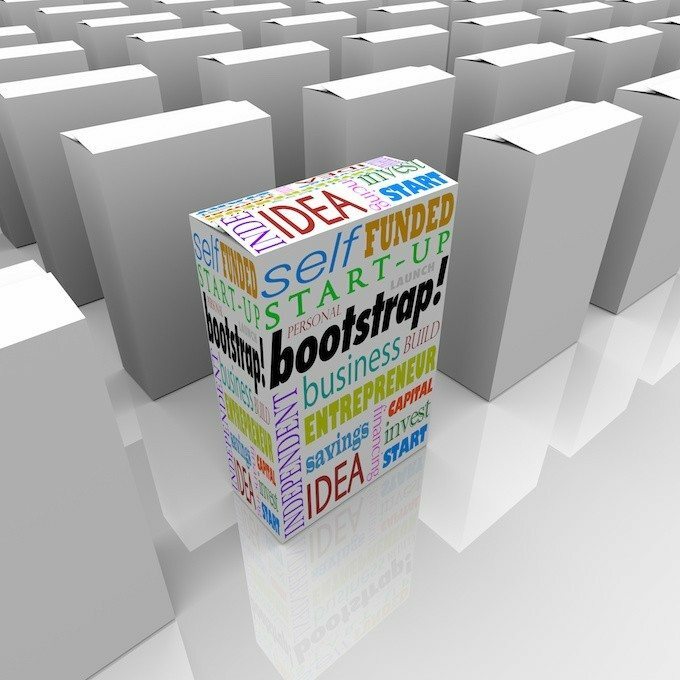 Questions: Which of these three key bootstrapping strategies is most helpful to you? What other bootstrapping strategies have you found helpful in launching your lifestyle business?